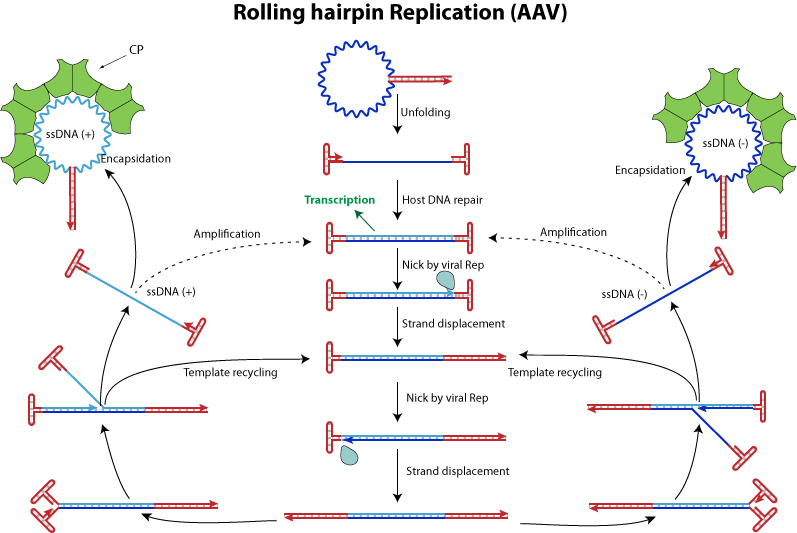 Rolling hairpin replicating genomes are single strand DNA with terminal hairpin structures. Upon infection, the 3' hairpin serves as primer for host reparation enzymes to convert viral ssDNA into dsDNA form used both for transcription and replication. Replication is active during the host cell S phase. It is initiated by a viral endonuclease called rep or NS1, which creates a nick between hairpin and coding sequences. This creates a 3' end that primes strand displacement replication and starts the rolling hairpin replication. Viruses having similar hairpins at both ends (AAV)produces equal amounts of ssDNA+ and ssDNA-. Viruses having disymmetric hairpins (MVM) produces predominantly ssDNA-. In both cases dimeric replicative intermediates are observed . Cellular defense against rolling hairpin replication: In mammalian cells, the PML bodies are interferon inducible nuclear structure that exerts a strong inhibition of nuclear virus replication. All virus replicating in the mammal cell nucleus are able to inhibit PML bodies, except satellite virus like Dependovirus which rely on adenovirus or herpesvirus co-infection to disrupt PML bodies . Herpes simplex virus type 1 ICP0 protein mediates activation of adeno-associated virus type 2 rep gene expression from a latent integrated form. Geoffroy MC, Epstein AL, Toublanc E, Moullier P, Salvetti A.